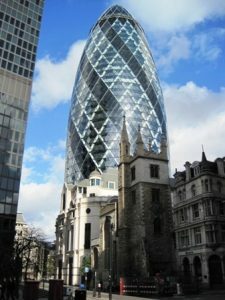 30 St Mary Axe was designed by Norman Foster and officially opened in 2004. The plaza at the base is open to the public but not the interior. Well before its opening, the building was nicknamed The Gherkin by the public (and by architects as The Towering Inuendo) It has 40 floors and a height of 180 metre, Spiralling lightwells give the exterior of the building a swirling, striped pattern of diamond shapes. Despite the shape of the building the only curved piece of glass is the summit cap. Energy use is minimised by using the sun’s rays to help heat and light the building. and the building’s aerodynamic shape is used to generate wind pressure differentials which are used to ventilate the building through the lightwells.